The Doris Dress is the perfect summers day dress. Feminine and romantic, throw it on and youll be set for that picnic in the park, day out at the beach, or hey, even a stint at the office. A truly versatile wardrobe staple, the Doris Dress will keep you looking elegant and put together no matter what you get up to this season. Inspired by Lisas love of vintage 1950s fashion and pretty feminine shapes, the Doris Dress is semi fitted with a flattering scooped neck bodice, bust pleats for delicate shaping and floaty grown on sleeves. The waist can be left unfitted for warmer days, or cinched in at the back with the attached ties or fixed back belt. The fluted panelled skirt has two length variations, short and cute above the knee, or an elegant below the knee option. The Doris Dress closes with a concealed zip in the side seam and has an optional buttonhole closure at the centre front. The bodice is finished with facings for a neat finish on the inside. 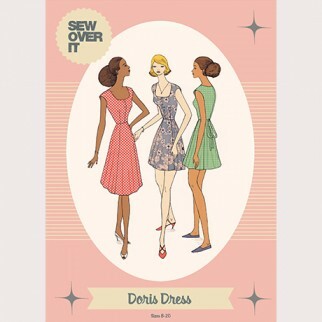 Due to the number of techniques covered, the Doris Dress is an intermediate level sewing pattern. Nothing is too tricky but we recommend that you have experience inserting a concealed zip. We recommend a lightweight woven fabric for the Doris Dress, ideally with a good amount of drape. The skirt and grown on sleeves will hang best if the fabric has some drape. Think rayon, viscose and crepe. However the Doris Dress also works beautifully in cotton, so if youre not experienced sewing with drapey fabrics and would prefer to use something more stable, you could try a cotton lawn, poplin, or a lightweight linen.